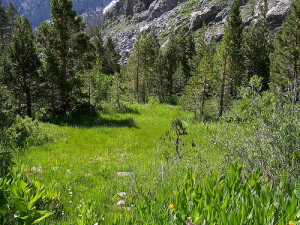 Because I couldn’t bring myself to see any more of “Basket Case,” here’s an image of a meadow. A nice, soothing meadow. We don’t even know what to say about this one besides “We’re very sorry.” Not so much for Bad Milo!, but for exposing anyone to Basket Case. Actually, we have plenty to say about just how very bad Basket Case is–it is possibly the worst film we’ve seen on Double Bill, and we don’t hold anything back when we discuss it. And it opens the door to talk about horror movies (including Bad Milo!) that are much, much better. Assignments for next time: The classic new Doctor Who episode, Blink, and 1987’s Mannequin.